Proven Strategies to Thrive in Mixed-Use Environments (May 21, 4:00-5:15, Westgate Hotel Ballrooms D-G): Streetsense’s Director of Research and Analysis, Heather Arnold, and its Principal Bruce Leonard will take to the stage for a workshop on the challenges and opportunities that arise from redeveloping existing shopping centers — and how to address them. From vision to sponsorship, co-tenancy and beyond, this workshop leaves no subject undiscussed. MAXI Awards (May 21, 5:30-7:30): Not only is Delucchi Plus a finalist at this year’s ceremony for our work with Peterson Companies on OUTBOX in Downtown Silver Spring, we’re also cheering on our client and fellow nominee, MarketPlace Development. We can’t wait to come out and see this year’s best of the best in retail real estate marketing. Bisnow Beltway Bash (May 22, 5:30-7:30, TAO Nightclub in the Venetian): Our team will be sponsoring the premier networking event for the D.C., Maryland and Virginia retail real estate community. Festivities begin at 5:30 sharp at TAO Nightclub in the Venetian Hotel. Say hello and enjoy heavy hors d’oeuvres and a premium open bar. Trust us, you are not going to want to miss this. 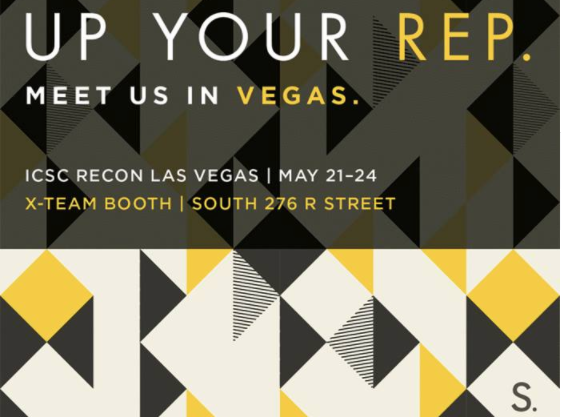 This year, stop by the X Team Booth at South 276 R Street to say hello and up your rep with our Streetsense colleagues. We’ll also be sure to report back on Facebook, Twitter and Instagram. Can’t wait to see you there!